We will be heading downsouth for a sunrise shoot on the 4th of June. There will be about a 45 minute drive from Sydney CBD as we are trying to capitalise on the late sunrise. Please indicate your interest here. will advise closer to the date.. Very interested...but I have prior arrangements...sorry guys! I've tried a IR filter during the sunrise and didn't find it to be very useful. When there is foliage, then it's another matter. YMMV as your IR filter maybe different. So.... do we have a planned meeting place and time by chance? I can see a couple of ocean pools there but other than that is there much of interest at cronulla? there is shark island and that stretch of coast but nothing else jumps out at me. Bundeena on the other side has some nice spots (for fishing anyway) but its a bit of hike. Hmm.. Was thinking just about the Ocean pools. biggerry wrote: is there much of interest at cronulla? there is shark island and that stretch of coast but nothing else jumps out at me. 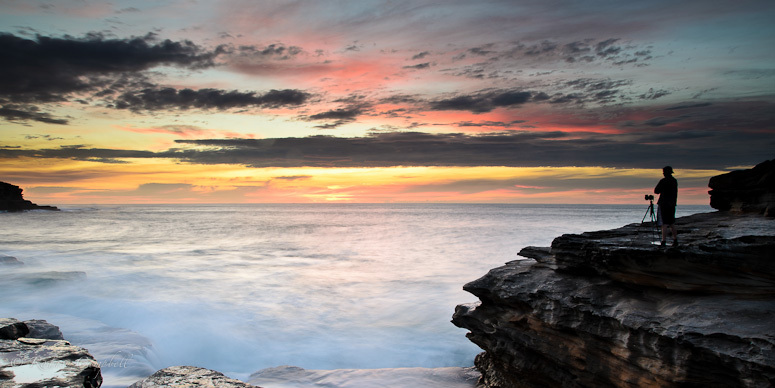 One more idea is to check out Botany Bay National Park? surenj wrote: One more idea is to check out Botany Bay National Park? I don't think it opens before Sunrise, which means you'd have a bit of a walk from the gate. You'd also have to walk a fair way around to get an easterly aspect. Oak Park might be a good location. There's a pool with rocks either side. how about little bay? access via the golf course to some more southern locations looks like there could be some promising rocks, it will be half tide and coming in so access could be interesting. if access is a biatch on the southern areas we can always drop back to little bay and trek around north or south. With sunrise @6:52 I assume something like 6am would be the go? Thanks everyone. Andrew the Oaks has been firmly put on the list. It's going to be Little Bay tomorrow. Meet at the Murra Murra Place car park for a 0545 departure. Very promising location.. will definitely be back there for another session. biggerry wrote: Very promising location.. will definitely be back there for another session. I thought it was a very nice place - easy to get to, lots of potential places to shoot and you didn't have to get drowned or even wet at all which I think is a plus. .... So we going to name our location...? - "Dragon Monolith" for the huge rock outcrop we were on? Gerry that is very neat indeed. You are an expert at positioning that grad! I couldn't get anywhere near that much color regardless. Ray, Nice shot as always! Here is a short clip to give an idea of the swell that day. I like this shot a lot. It looks like all of you had a ball out there, I am very much jealous that I missed that one. Next time I guess. I really have to make it too more of these shoots! Suren, are we losing you to the video boys? aim54x wrote: Suren, are we losing you to the video boys? Ray I really like the large gent shot. Looks like everyone had a good morning. Jenno wrote: Well I ended up at Avalon Beach (got your location advice too late) and encountered dangerous surf like you guys did and some nice colour in the sky. seriously though - great shot from the pool with the big dude perfect timing and nailed the shutter on that one, composition is premo to boot. Remorhaz wrote: .... So we going to name our location...? - "Dragon Monolith" for the huge rock outcrop we were on? surenj wrote: Gerry that is very neat indeed. You are an expert at positioning that grad! I couldn't get anywhere near that much color regardless. to give you a bit of an idea of teh swell size and scale, the little pole on the rock stands about the height of a person, this wave was certainly not the largest whilst we were there.. Send me a telegram next time young fella. Jenno wrote: Send me a telegram next time young fella. Hey Gerry, How did you hide the line from the hard edged filter in that last lot of photos? Tel what? We will send a smoke signal or a pidgeon next time. Make sure you have compatible hardware to receive them. surenj wrote: Hey Gerry, How did you hide the line from the hard edged filter in that last lot of photos? Bottom line is, we are yet to explore the Shire but will do so in the near future. Perhaps. Maybe..